...the Greywater Guerrillas, a team focused on promoting and installing clandestine plumbing systems that recycle gray water — the effluent of sinks, showers and washing machines — to flush toilets or irrigate gardens. They're based in Oakland! They've been rigging up homemade greywater recycling gizmos all over! One of 'em is transgendered! Yay, Oakland! Go ahead, the rest of you, laugh. But my homeys are researching where my government (and yours) won't - trying to figure out how to survive on less water. This problem is vital. Water is going to keep getting scarcer. I don't have a greywater system yet. I don't even have that clothesline I've been threatening to put up. But I'm proud of my sister/fellow Oaklanders anyway. Professor Andrew Bacevich, a conservative and an opponent of the Iraq war, writes in the Washington Post: I Lost My Son to a War I Oppose. We Were Both Doing Our Duty. .
Dulce et decorum est/pro patria mori. Colonel Patrick Lang of Virginia, a US Military senior intelligence official (retired), keeps a blog. He recommends you read this report on the situation in Nahr al-Bared, Lebanon. Colonel Lang is an American patriot and an expert on defense and intelligence affairs, especially the Middle East. He reads and speaks Arabic BTW. Read his bio for his credentials. I would not have linked to the article in Counterpunch without Col. Lang's imprimatur. It's worth reading. It is not hopeful. I post it because it needs to be read, to counteract the propaganda in the mainstream news. If you believe Colonel Lang is just another "Syrian dupe", try telling him that to his face. Read this report from a Beirut college professor who just went into the camp where the displaced from Nahr al Bared have fled: Land and People: Food for thought: In the Beddawi refugee camp. Something is very wrong here. Whatever happened at Nahr al-Bared, it is not what the first reports claim. We may never know why these people suddenly attacked the Lebanese army checkpoint, killing twenty soldiers. As usual in Lebanon, the bystanders all point fingers based on their own prejudices, while the innocent suffer for the crimes of their neighbors. And furthermore, shelling civilians is a war crime. You don't do it, according to the Geneva Conventions. America does it in Iraq, Israel does it in Lebanon and Gaza, so I guess the Lebanese Army feels like they can do it with impunity, and no one will call them to account. The footage on Aljazeera tonight from inside the Nahr Al-Barid refugee camp is sufficient to condemn all those who stayed silent during another chapter of agony for the Palestinians in Lebanon. I am sickened by the rising manifestations of Lebanese patriotism: by the unending tributes for an Army that was too scared to defend the homeland when Israel invaded last summer. This bombing is not good for the future of Lebanon. If Fatah al-Islam is such a problem, aren't there other ways to address it than by causing immense suffering among civilians, and thereby creating a whole new generation of future recruits to terrorism? The decades of attacks on Ain-el-Helweh camp led directly to the events of 1985 that killed my grandmother in Mieh-mieh and uprooted all of my kinsmen. Bombing refugee camps to "eradicate terrorism" just creates more terrorism. It may be a basic human instinct to want to eradicate (massacre, exterminate, commit genocide) your enemies, but acting on this instinct does not make you or your property safer. Mass extermination of the Palestinians of Lebanon will not make Lebanese safer. Mass bombing with "only" 40 or 80 or 100 dead will not make Lebanese safer, either. I fear we are in a spiral of death. I fear much worse will follow. Human Rights Watch is on the case. Sadly, my American government is too blind, stupid and bloodthirsty to intervene in this. And it looks like the Arab governments don't care, either. Professor Juan Cole, London Times reporter Nicholas Blanford, and an anonymous Beirut commenter have the early run-down, including explanations of who Fatah-al-Islam are (hint - Seymour Hersh wrote about them already in the New Yorker). I will be updating my "Lebanon Round-up" sidebar soon. Until then, feel free to browse the links at right for background information. We're all staying calm. It's the only thing to do. Pray that the Lebanese back away from this precipice as well. This Lebanese blog and its Beirut-based author are my dream come true: Land and People. Besides being a blog for food, farming and rural society, Land and People is also a rural development program. The motto of the program is “Celebrating local culture/ Enhancing rural livelihoods". It was borne in the aftermath of the Israeli war on Lebanon of July 2006, with the aim of helping local communities of the South rebuild their shattered livelihoods. The post describes the fabulous local artisanal, traditional products Land and People developed and found markets for: Laurel olive oil soap, three kinds of unique local breads, and cultivated za'atar (Lebanese thyme used in an herb mixture as a condiment). The people behind the blog helped the small producers get a table at the Beirut farmers' market, and their stuff sold out immediately. Read the post to find out more. 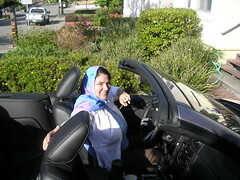 On her way to pick up Neil McFarquhar of the New York Times, fabulous writer and professor Mohja Kahf posed in my driveway. Too bad I didn't have the camera the day before when I met her at Mills and she had her sunglasses (lost later at a reading in SF). You'll have to imagine her with that cigarette holder clenched in her teeth like FDR, sunglasses, headscarf, Mustang with the top down in the pouring California sunshine. I was so sure the New York Times would get a picture of her like this! They got the story but not the photo. Dr. Kahf honored us with a visit during her stay. She's a lovely human being as well as a fine poet and novelist. Hat tip to Laila Lalami for finding the Times article about Mohja.